Eastman Associates of Oneonta is building the new bridge over Liddle Brook at the Andes Central School. This bridge was designed by Michael Hilton Bellows, Architect, with a blue stone arch and wall to look like the original from 1938 but be up to the 2018 code. 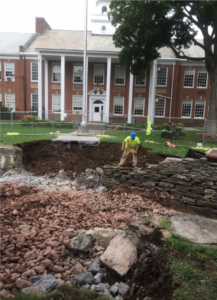 Since Eastman got a late start, the bridge will not be completed until October 26th. In the interim, students, staff and guests will enter the school by the side door.